Will it or won't it have built in GPS? 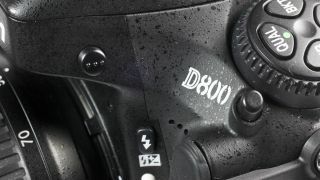 Will a more affordable version of the D800 be announced this summer? A new set of Nikon D600 specs have appeared, ahead of its rumoured summer release date. There has been a fair amount of hype surrounding the rumoured new release, which is said to be a full-frame camera to sit below the recently announced 36 million pixel Nikon D800 as a more affordable version. The most recent specs list includes a 24.7 million pixel full-frame sensor, a 3.2 inch LCD screen and full HD at a variety of frame rates. It had previously been suggested that the D600, like cameras lower in Nikon's range wouldn't have a built in autofocus motor, but there appears to have been a backtrack in that suggestion for the time being. Another mooted spec now appearing to be in doubt is the possibility of built-in GPS. If such a spec was included, it would mark the first time a DSLR had included the function. Other apparent specs include 39 autofocus points, AF face detection, and a weather-sealed body. It's already been a big year for Nikon, with three DSLR releases in the past five months. It seems that Nikon is keen to dominate camera sales, taking the shine away from its biggest rival Canon in 2012. The D800 is already cheaper than the 5D Mark III, so introducing an even cheaper full-frame option could be a shrewd way to garner an even bigger market share.